Do you like Macaroni and cheese? Macaroni and cheese is for emergency situations only. I can eat it, but it's definitely not on the top of my list of favourite foods. I always end up with that horribly smelly kind of cheese, too. :( And as far as your gender divide theory goes - I'm a girl. I eat pasta almost everyday, so yes, I like macaroni and cheese. Are you specifically asking about Kraft Mac and Cheese? I'll eat it (really, I'll eat most things), but I prefer homemade macaroni and cheese with, like, stewed tomatoes on top. Good mac & cheese is great, like the kind my mom used to make. But it's always a side dish, never the main attraction. i like the mac n cheese that has the noodles shaped like little conch shells. yum. now i want some. cici's has mac n cheese pizza. i wonder what that's like. I used to love the mac/cheese combo my old school used to make. I've yet to re-experience that taste. I love mac & cheese. But it's what I resort to only when I've got no other choices. I can go for Kraft Mac and Cheese, but not so much on any other kind of Mac and Cheese. I like the “Kraft Dinner” type but most home-made varieties I don't like. My mom makes this casarole-style cheese-topped noodle thing that I hate. It's served in slices! I can't eat pasta in slices! The best Mac n' Cheese I've had was this vegan dish that my friend Shawn made, the sauce cooled a bit fast and of course it wasn't real cheese but it was pretty convincing as fake cheese goes. And it was spicy which made it better. Ew! Bacon in there! I'll eat bacon if it's cooked crispy on its own but in Macaroni it reaches a new level of ick- we move up to Defcon Urk! omg Marguati, that second one looks so yummy! I like it okay, not my fav foods. One of my male friends and all my brothers (I have 7) could live off it. I like pasta but Mac'n'cheese tends to be too heavy. Depends on my mood – and the shape of the noodles, and the type of cheese. Macaroni is any shape non-egg-based pasta… So, technically, fettuccine alfredo is “mac and cheese” – and delicious. The right-from-a-box Kraft stuff is just sustain-my-life cheap food – a step down from Top Ramen – except I have to actually have milk on hand. Those straight tubes and never-quite right psychedelic orange powdered cheese don't cut it. Mac and cheese is best with elbow macaroni and some *good quality* creamy cheese (I like good cheddar, or white cheddar). It's also best with some added spices, veggies, etc. In college, I got pretty good at dressing up the cheap, crap food to create appetizing meals. Hmm… I'm not sure about the people you know, but most men I know lack a certain amount of culinary prowess. When they make anything, it's straight out of the box, into the microwave, no stirring, no dressing up – as quick as possible from cupboard to stomach. More of the women tend to modify recipes, add things, and take more time in the cooking process. Ew, don't put things in the macaroni and cheese! Then it becomes… I dunno, something else. Cheesy bacon melt or something. Evidently none of you know what real macaroni and cheese is. Real macaroni and cheese doesn't come from a box, like Kraft, and isn't littered with different things inside. It is simplicity. It is delicious. And the best macaroni and cheese is easily my mother's non-secret recipe that involves crunching up a bunch of Saltine crackers to dust the top of it, almost like a casserole but without the consistency of a casserole. And served nice and hot, filled with various types of melted cheese, well let me tell you, there is no greater joy on this planet. Except cheesecake, and that's a topic for another discussion. Oh, and I'm male by the way, and actually I don't know anyone who doesn't like my mother's macaroni and cheese. Heck, even guests love it at meals. Out of all the posts here only Skool's makes me intrigued enough to possibly try. S'okay. Don't hate it, don't love it. That sounds like what my family makes as well–it's like a casserole, just as you said. We don't use saltines, though. We use breadcrumbs and scoop large portions of it onto everyone's plates and pour stewed tomatoes over the top. Delicious. Awesome, I win the thread! This is how I make mac & cheese. …The secret is using sour cream for the binder as opposed to milk, which is what most people use. Boil the macaroni so it is a little overcooked & set aside. Mix the eggs, sour cream, & salt/pepper together in a bowl and combine the mixture with the macaroni. Set bowl aside. Slice cheese in very thin strips. 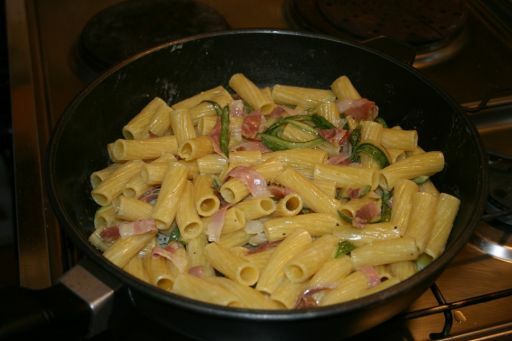 Layer macaroni mixture and strips of cheese in alternate layers in casserole dish. Cook in 400 degree oven for about 20 minutes or until top is slightly golden brown. the day someone will invent a way to attach physical objects to email, I'll make you change your mind! If anything bad happens,I'm blaming Global Warming.